I have a clogged drain from my shower. Commercial products like Savo or WC Net totally don't work. Is there any chemical substance which can be bought without permission or which can be made easily to clear the drain? I live in Czech Republic, it's part of European Union, just for your information about the law system here (can be helpful to decide what's legal). My first idea is sodium hydroxide, is it powerful enough? I don't know what the products you mention contain, but you basically have four chemical weapons, and two physical weapons against a clogged drain. Choosing depends on the nature of the clog, which is hard to guess. Acidity: sulfuric acid. ’nough said. Basicity (causticity): lye, a.k.a. “caustic soda”, a.k.a. sodium hydroxide. Enzymes: take time to act, but can be very powerful. This you should find at an eco-friendly store or supermarket aisle. Hot water: if the pipe is clogged by solidified fats, boiling water can melt them and unclog. Hardly typical for a shower drain, but very often useful for kitchen sink. Last, but not least: mechanical action. Either a drain snake, or a plunger. Most often, the clog is a localized problem, and by breaking it into smaller parts, you will restore the flow. For a typical shower drain, hair and other organic matter is most likely the issue, so I would choose drain snake first, then sodium hydroxide, then enzymes. Not a chemistry answer: but a very successful one, in my experience: get a Ropump. It's a cross between a plunger and a bicycle pump. 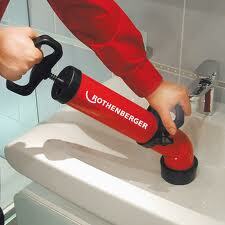 It makes drain-unclogging a pleasure. Mechanical action is just so much more successful for this task, than chemical. Because water is extremely resistant to being compressed, the Ropump's action, in turning water into a liquid drain rod and forcing it down the drain, has a pretty high success rate. You pull plunger out, while the far end sits in a reservoir of water. This fills the body of the pump with water. You then fit the far end over the blocked drain, and push the plunger in, forcing the water down the drain, and displacing the blockage. In the end, you don't know what the chemistry is at the blockage. So it's easier to anticipate the unintended consequences of a mechanical, rather than chemical, intervention. I am able to detach the bend to the outside drain. I then push a hose pipe in as far as possible. This clears a lot of stuff. I have also inserted a water-blaster at both ends. This was most successful but the shower cubicle then needs rinsing. Not the answer you're looking for? Browse other questions tagged everyday-chemistry acid-base or ask your own question. What are the products formed when CH3CH2OH reacts with NaH? What home products are reactive with glass? How does % purity on household products work? Predicting products of chemical equations?